JB4QAI: ATEX junction and equalisation box. Designed and made according to the ATEX directive, group II category 2GD, according to the IEC/EN60079-0, IEC/EN60079-11, and IEC/EN60079-31 norms. NOTE: the dimensions are not compatibles for mounting on 4 load cells platforms/pallet weighers. JB2QAI Stainless steel IP66, ATEX, equalisation box for up to 2 load cells. 2 + 1 fairleads. Protection modes: ATEX II 2G Ex ib IIC T6 Gb for gases, ATEX II 2D Ex tb IIIC T115°C Db IP65 for dusts. Complete with manual and ATEX CE CONFORMITY DECLARATIONS (available in EN, DE, FR and IT). JB3QAI Stainless steel IP66, ATEX, equalisation box for up to 3 load cells. 3 + 1 fairleads. Protection modes: ATEX II 2G Ex ib IIC T6 Gb for gases, ATEX II 2D Ex tb IIIC T115°C Db IP65 for dusts. Complete with manual and ATEX CE CONFORMITY DECLARATIONS (available in EN, DE, FR and IT). 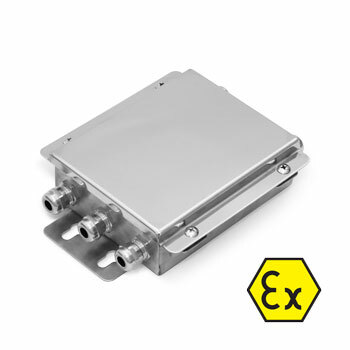 JB4A Junction box for up to 4 cells for hazardous areas ATEX, in ABS IP67, with 4 + 1 fairleads for connection with up to 4 load cells. Protection modes: ATEX II 2G Ex ib IIC T6 Gb for gases, ATEX II 2D Ex tb IIIC T115°C Db IP65 for dusts. Complete with manual and ATEX CE CONFORMITY DECLARATIONS (available in EN, DE, FR and IT). JB4AI Stainless steel IP66, ATEX, juntion box for up to 4 cells. 4 + 1 fairleads. Protection modes: ATEX II 2G Ex ib IIC T6 Gb for gases, ATEX II 2D Ex tb IIIC T115°C Db IP65 for dusts. Complete with manual and ATEX CE CONFORMITY DECLARATIONS (available in EN, DE, FR and IT).